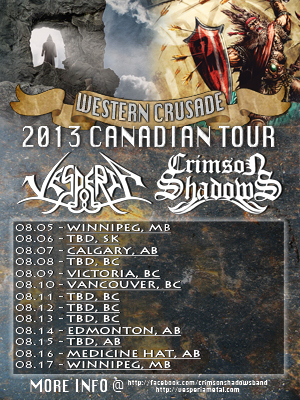 Canadian epic metal bands VESPERIA and CRIMSON SHADOWS (Spread the Metal Records) just announced plans to join forces on their first trans-continental tour entitled WESTERN CRUSADE CANADIAN TOUR! This August, VESPERIA & CRIMSON SHADOWS (who both just recently rose to the finals of the 2013 Wacken Battle Canada) will hit the trans-Canada Highway from South Ontario to Victoria British Columbia and back in stoic determination to bring their epic metal assault Canada-wide! VESPERIA’s new album AN OLDEN TALE was recorded between October 2012 and March 2013 with Thomas Ireland (Icehouse Studios, Battlesoul) in Goderich, ON. The cover artwork for the album was done by Jan Yrlund, whose art credits include TYR, KORPIKLAANI, MANOWAR & APOCALYPTICA. This entry was posted in METAL and tagged 2013 Wacken Battle Canada, An Olden Tales, Apocalyptica, August, BandCamp, BigCartel, Blackguard, Calgary, Canada, Crimson Shadows, Edmonton, Entertainment, Korpiklaani, Manowar, Music, Oshawa, Pints Held High, Spread the Metal Records, Týr, Vesperia, Victoria British Columbia, video, Winnipeg. Bookmark the permalink.